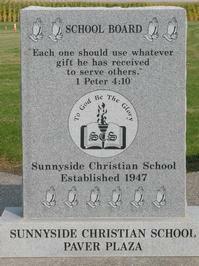 You can become a part of Sunnyside Christian School history by having your family name or company name imprinted on a paver. This is your opportunity to leave more than just a memory at SCS. Your contribution provides a visible reminder that our faith in God is the stepping stone to the future. Sunnyside Christian School began its journey of faith over 60 years ago, and this will be a visible reminder of His faithfulness to many generations. 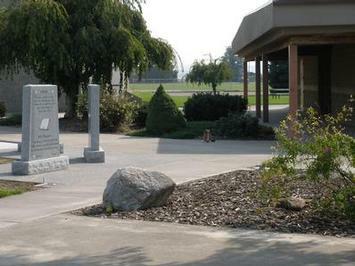 The Paver Plaza has three testimonial stones in place. These are the large, upright stones you can see in the pictures. These stones are in special recognition of people involved with Sunnyside Christian School: Staff, School Board Members, and Foundation Board Members. God has used these people in special ways to accomplish His will at SCS. The Individual Pavers are placed in the area adjacent to these testimonial stones. Click on the link below to see a page with pictures of many of the Pavers that are in place. These Individual Pavers are available in a variety of sizes/costs. We invite you to look at the Paver Order Form (see link below) to see your options, and to stop by the High School Campus to view the Paver Plaza. Pavers are placed along the walkway to the SCHS Gym. Each paver is a real stone, laser engraved with your message to last a lifetime. 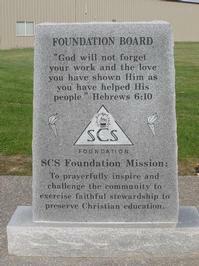 All donations are designated to the SCS Foundation Endowment Fund. SCS staff, School Board members, and Foundation Board members will have a logo engraved on their pavers as a thank you for the years of service given to SCS. Check out this link to see pictures of several of the Pavers already in place. See how other SCS supporters have engraved their Pavers. Use this form to order a Paver. Questions? Want help with your design? Contact the Foundation Office by phone or e-mail, we'll be happy to help. These stones and pavers are a reminder of God's faithfulness to SCS in the past 60 years of "providing a Christ-centered Bible-based, quality education for distinctly Christian living" to the students who have walked through our doors. These stones and pavers will continue to stand as a testament to God's faithfulness as we work together to continue "providing a Christ-centered" education to all families who desire this for their children. A visible reminder that our faith in God is the stepping stone to the future. 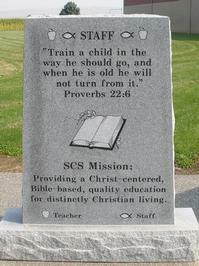 A way to support a quality Christian Education for today and tomorrow. An opportunity to invest your gift so future earnings can be donated to SCS. A legacy in your family's or company's name that will last a lifetime. Thank You, From . . .